Add the below web address to your home screen for direct access to the Course Status and Upcoming Events. 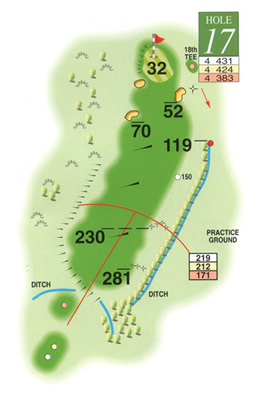 From the tee the hole dog-legs to the left but the wide sloping fairway can provide the lusty tee shot with a comfortable second into the green but centre to right side is the ideal drive as the ball tends to run away left on the slope. The nature of the hole has changed over recent years as in former times any good shot right of the green would automatically run left and offer a good putting opportunity but today the ground movement over the years has flattened this area and a straighter second is now required avoiding the left and right guardian bunkers onto a long and narrow green where once more pace and direction are key.